The 10-point list below will help alleviate your concerns, as you check off each item to create your best email campaign ever. 1) Use an Email Builder. With plenty of inexpensive and effective email marketing systems out there, there’s no excuse not to use one. They keep your email campaign looking professional. They maximize your delivery success. They help you manage your database. They include essential reporting features. 2) Prevent Spam Complaints. There’s a reason it’s called ‘permission marketing’. Be sure your readers have chosen to receive your emails. For more anti-spam tips, read this. 3) Match It! Creating an email that compliments your existing marketing makes it easier for readers to identify you and your brand. 4) Add Visuals. Make your email an experience, rather than a report, by adding plenty of imagery. Video content is an added bonus. Some readers opt for text-only messages, but the ones that don’t are expecting some eye candy. 5) Relate to Your Peeps. Keep your content relevant and concise. Be sure your emails contain material that is of direct interest to your target audience. 7) Include a Call to Action. What are they supposed to do with your email? Print it for an in-store discount? Click through to your website? Call you for a quote? Tell your reader what to do next. And, for the record, ALWAYS include your contact information! 8) Rock the Subject Line. The subject line is often the arbiter of whether a reader even opens your email. Studies have shown that short, sweet and to the point provides the highest open rate. 9) USE Your Reports. Email marketing systems just about always include a report feature that allows you to view open rates, click rates, unsubscribe rates and other handy information. Review every report. Use what you see to modify content, links and subject lines to maximize opens and clicks. The day you stop improving on the last email is the day you start losing your customers’ interest. 10) Generic is Out. Custom is King. Generic templates are always available to get you started, but they are meant to be customized. Let the character of your business shine through. If you’re interested in amping up the content and appearance of your emails, contact us! We’ll take you to a new level of e-communication. You’ve worked hard to collect those email addresses for your monthly or weekly e-Newsletter, and now one of your recipients – a client, in fact – has just reported you as “Spam”. What gives?! Those abuse complaints can hurt, but if you catch a person with the wrong content on the wrong day, sometimes it . just . happens. And it has nothing to do with whether or not they like you. 1) Stick With Who You Know. A list of 100 loyal clients who specifically signed up to receive your e-Newsletter will consistently outperform a purchased (which, by the way, doesn’t jive with today’s internet marketing regulations) list of 1,000 random strangers who have no reason to trust or even need your business. DMT clients build a super-glue-strong email following the good, ol’ organic way – by getting permission! 2) Keep the Subject Line Real. Contrary to popular belief, witty email subject lines drop open rates like deadweight. If it’s not immediately obvious what your e-Newsletter is all about – “Acme Co. February Newsletter”, “Acme Co. Summer Blow Out Sale” – then it’s suspect. And we all know where “suspect emails” end up, don’t we? The graveyard of the email world a.k.a. the Spam Folder. DMT e-Newsletter subject lines blend simplicity, honesty and stating-the-obvious to keep those open rates up! 3) Include YOU. In an earlier post, I talked about the importance of putting a face to your marketing. Add some humanness to your e-Newsletter with images of – and stories about – you and your staff. DMT includes clients, staff and their photos in every e-Newsletter send. 4) Variety is the Spice of Life. Newsletters, by their very nature, contain a little bit of something for everyone. If one topic doesn’t interest a reader, another one will. That’s how you keep ’em coming back for more! DMT incorporates feature stories, fun trivia, staff spotlights and more to appeal to a broad audience. 5) When You Think It’s Short Enough, Keep Going. Online attention spans range from short to shorter, so your content should follow suit. A three page dissertation on the qualities of your product is more appropriate for a pamphlet than an e-Newsletter. DMT e-Newsletter articles feed relevant, useful and cool information in byte-sized pieces. Don’t wait until your favorite client banishes your e-newsletter to the Spam Folder. Makeover your e-Newsletters with your readers in mind, and watch those open rates climb and spam complaints plummet! This post is a quick congratulations to superstar client, Grand River Dental. Their recent debut newsletter (designed by yours truly) notched up a stellar open rate… which means – guess what! – their clients like and trust them! Speaking as one of their die-hard clients and fans, I can’t think of another dentist office where conversations about American Idol and Caribbean cruises are commonplace, laughter abounds, the dentist sings musicals, the charming staff includes a four-legged fuzzball who loves “belly wubs” and patients swap cheery banter across the privacy partitions. No wonder their e-newsletter open rate reached for the stars… and caught one. Way to go Grand River Dental! 3) It’s about giving freely. 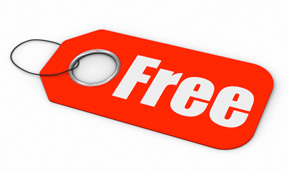 Yes, I did use “free” in that sentence – one of the most powerful words in a modern business’s lexicon. In our web-based world, someone somewhere is just about always offering what you offer free of charge. It may not be as cool or as convenient but, let’s face it, the difference between a penny and FREE is as vast as the Atlantic Ocean. Turn off the Code Red! This doesn’t mean you need to give away the farm. Free information (think blogging, websites, social media, e-newsletters), free instruction (think seminars, on-the-floor demos) and free time (think volunteering for a cause) are all perfectly legitimate ways to jump on the “free” bandwagon, without devaluing what you do or sell. Instead, it builds your reputation as an Ultimate Resource. So with the old school, assembly-line-style marketing out of the picture, you’ll find yourself having a lot more fun with your marketing, and your customers having a lot more fun patronizing your business. Win-win all around! What modern marketing adventure will you tackle next? Please share!